Cassie Oursler slept like many other young girls. Her Grand Island, NY bedroom was covered in Tinkerbell paraphernalia from top to bottom, sending her off to far away dreams of fairy tales and Disney Princess. Fast forward about 15 years and Oursler doesn’t find herself amongst the Lost Boys of NeverLand. In fact, quite the opposite, living out a different kind of dream roughly 12 miles from her hometown. The 23 year old is not a Disney Princess, but more comparable to a “real life” super hero, demonstrated in both her strong six-foot, three-inch stature and commanding presence. It’s often on display at Alumni Arena where she is the starting center for the Buffalo Bulls Women’s Basketball team. That’s what the senior psychology major will tell you when asking about the reality of her playing career as a Bull winding down. Considering Oursler’s output over her team’s current six game win streak, “go time” almost seems an understatement. Averaging 17 points and 11 rebounds in just 26 minutes over those past six, she is quite frankly rolling through any Mid- American foe lined up across the court. There are many factors that lead up to the most recent dominance. “My body is on my side and I’m feeling fresh” says Oursler, who experienced a rough January of sickness and eventually the flu. 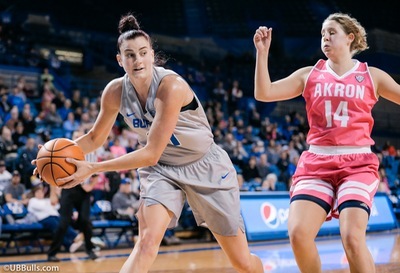 While it’s very encouraging for the UB program to have their inside anchor feeling healthy and good in February, the reigning MAC East Player of the Week deserves a majority of this credit from her dedication and commitment to last summer’s offseason conditioning program. There is no question that the tireless work put in many months ago is still paying dividends to Ousler’s production as she is often scoring layups …on rim runs…. in the fourth quarter…. in February. Upon joining the Buffalo program as a transfer from Robert Morris during the 2014-15 season, Cassie was immediately impacted by the first-time experience in having a head coach who was a post player herself. Enter Felisha Legette-Jack, who in her own playing career graduated from Syracuse in 1989 as the all time leading scorer and rebounder in program history. “How could you not respect every word out of her mouth” says Oursler, who will admit that the earlier years during her time at UB were personally challenging. “I would get so frustrated in practice, I would feel like I wasn’t living up to her expectations of me”. However, it’s a relationship where Oursler never felt like she was given up on, and she always had this particular staff in her corner. That motivated her to reach higher. Kristen Sharkey, an assistant coach who works heavily with the post position, was also a very successful inside player herself. What makes this player-coach dynamic a little extra special is that Sharkey was also a star at Alumni Arena. She led the Bulls in the beginning of the Legette- Jack era, graduating somewhat recently in 2015. It was Sharkey’s senior year when Ousler joined UB. “Coach Sharkey has really taught me how to be a leader from the post position. A lot of the game runs through the guards but I can lead and be a presence from the post too”. This concept has been very evident as Oursler is a loud and vocal communicator on the court, which in turn , has commanded attention from teammates and the competition alike. After winning an appeal to give her this final year of eligibility (NCAA transfer regulations), Cassie was full steam ahead. It’s safe to state that Cassie has shown her appreciation for her time earned back in Western New York. It’s not just through her hard work and dedication to her own game, directly impacting program success, but also through the example she is setting in the community. It’s unique when Oursler has the opportunity to go out and speak with young children – especially when she can spot one standing a little head above the crowd. But Cassie didn’t always love her height. She needed her coach to look her in the eyes, and convince her. Oursler is now owning her physical size- and embracing it as a gift. While a sweet outside stroke on her perimeter shot may look like it’s been sprinkled with Tinkerbell’s pixie dust, that’s about the only soft finesses you can expect. The tone in Cassie’s game is more like Wonder Woman, strong confident and resilient. The Bulls have officially clinched their first ever MAC East Regular Season Title where they avoid a first round campus-site playoff game. The guaranteed top two seed (highest in program history) leads to a direct invite to Cleveland for the upcoming Mid American Conference Tournament. Buffalo is receiving votes in USA Today’s Top 25 Poll for the 5th consecutive week, has now entered ESPN’s Women’s Basketball Mid-Major Top 10 Ranking (#10) and sits 15th nationally in the RPI. This is an NCAA Tournament team. While Oursler will have professional basketball opportunities, the focus still remains one game at a time. Big games demand big players. Right now, no one’s playing bigger than Cassie Oursler.